Maybe you, like me, drank your fair share of Cherry Limeade growing up. There was a Sonic across the street from my high school so, after school, before volleyball or soccer games, and on the way to or from nearly anywhere, we’d drive through and order a Route 44 Cherry Limeade. Oh, how I wish I could have all that corn syrup, red dye, and artificial flavoring back. Bleh. But since I can’t, I’ve made my own. My homemade version of this classic fountain drink is made from just four, all natural ingredients: cherries, lime juice (get this handy lemon and lime squeezer! ), honey, and water. And it only takes a few minutes to make in the blender. 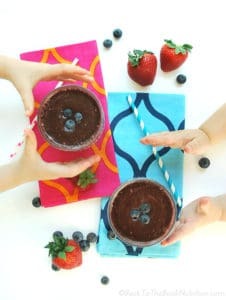 The first time I made it a couple of weeks ago, I slurped it down just like old times, taking in the bold flavors of the sweet black cherries and refreshing lime! Predictably, my kids slurped theirs down too. I love that they’re learning that real, whole foods created by God really are better than the chemically concocted ones that fill the grocery aisles and drive throughs! I’ve already had multiple requests to make it again, so I’m sure we’ll be seeing more of it as the summer heat sets in! Place the first 3 ingredients in the blender and blend until well mixed. Add cherries and continue blending until mixture is smooth. Pour over ice and garnish with cherries and/or lime wedges before serving. Frozen, pitted cherries are much cheaper than fresh - I bought frozen organic cherries from Costco for around $2.50/pound! 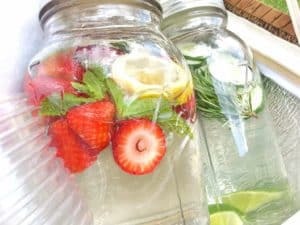 Try these other refreshing summer drinks! This drink sounds so refreshing for the summer. It reminds me of the Gratta Checca we had in Rome after school. That also was (is) full of sweet syrup. I much more like your version. I will try. I love cherry limeade! Love how simple the ingredients are too. Pinning! That sounds like such a fantastic combination of sweet and tart! I have to give this a try! Thanks for sharing! You’re welcome, Beth – glad you stopped by! This looks brilliant! It is the perfect summer treat for this terrible heat without the guilt of sugar and high calories. I can’t wait to make this. It is perfect for entertaining on the patio. Thank you, Katie – enjoy!